The Calla Lily has a long and rich history. The flowers originate from Southern Africa, and are in fact not callas or lilies. They emerge from rhizomes, which technically describes a rootstalk or plant growing from a root. The Calla Lily is closed related to the ginger root. It was first catalogued by botanists around 1750, and became the de facto symbol of love in Victoria England. Since that time, calla lilies continue to grace weddings and other ceremonies of love and commitment, available in multiple colors, yet best known for their purest of white petals. In celebration of love, we offer our calla lily wedding favor ideas to compliment your wedding tables and guests' gifts. 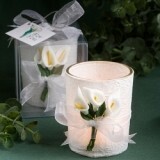 You'll find calla lily toasting flutes, place card holders, tea light candles for the wedding tables and much more. 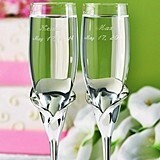 PartyFavorSource.com offers a vast array of calla lily favors. If you can't find the perfect calla lily party favor, please click on the Contact Us link above and let us know what your needs are. We're happy to help.